RC just wanted to make a quick note before tonight's game. We knew that Shane Costa was scheduled to return to the Royals today after his rehab in Wichita went well, but we didn't know for certain who they'd send off the Major League roster to make room. The speculation was that it would be Justin Huber, which was certainly our preference, but we wondered if the Royals would be comfortable carrying six outfielders and only five infielders. 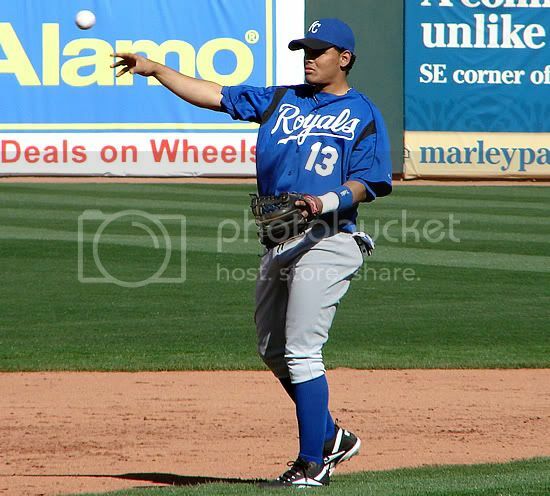 Well, the Royals today did in fact make the obvious choice by replacing Huber with Costa, but they also trimmed the abundance of outfielders by sending Kerry Robinson away and recalling Andres Blanco, who was hitting .282/.324/.405 in Omaha. Blanco got off to a great start this season but has cooled off a bit recently, and his defense has been surprisingly poor -- he made 12 errors in 38 games. Buddy Bell said before tonight's game that Blanco will spell Angel Berroa on occasion while he's up, so hopefully he won't get the Huber treatment (he's not starting tonight). A pleasant surprise...No more Kerry Robinson, and less playing time for Angel Berroa (hopefully). Of course, the equally exciting thing about today's roster move is that we no longer have to watch Robinson bat leadoff. We feared that since Robinson was the first outfielder called up when both Costa and David DeJesus went down, Aaron Guiel -- who is a far superior player -- might be the first outfielder sent away. Thankfully, that wasn't the case. Anyway, it's almost time for the game to start. The most important thing is that we BEAT THE CARDS! Nice crooked number on the board, guys, but let's try to be a little bit more patient. Yeah, I'm thrilled they brought up another utility infielder so German can play even less. Another brilliant front office decision. Has Blanco filled out a little bit? I really don't see Blanco taking any playing time from German. German hasn't played a single game at SS this year, and even Buddy Bell can't possibly be stupid enough to play Blanco at 2B while keeping German on the bench. I was at the game tonight, and wrote in Esteban German on my All-Star ballot. With one out left and needing a baserunner to have a chance to tie the game, Buddy pinch-hit Paul Bako for John Buck, leaving Aaron Guiel on the bench. The radio guys' justification for it was that Guiel should have a chance to bat with a runner on because he has better home run power and the Royals needed 2 to tie the game. And, of course, Paul Bako is the man you turn to when you need a baserunner. I was in my car and laughed so hard I darn near wrecked. Can't get much more exciting than watching the worst team in baseball trot out the Geritol gang....Royals Baseball! I live for this! We should all applaud Dave Glass, Dan Glass, Allard Baird, Budddddy Bell for their generosity in bringing in and playing such great talent! I got that warm fuzzy feeling we're gonna see that 60 win mark with this bunch! This is flat out retarded. German is the PERFECT leadoff man for this team, even when DeJesus returns. PERFECT. Not decent. Not pretty good. PERFECT. Can someone please tell me ONE thing that Graffanino does better than German WHATSOEVER. He is an okay player, but nowhere NEAR good enough to be taking time away from German on ANY other team in baseball, except for Buddy Bell's Royals. Just flat our retarded. German should be our 3B the rest of this year and should be a starter for many years to come. Guiel should be starting over Brown in LF for a while, and I liked what I saw from Blanco at SS last night, and even got a hit. Start him at SS and release Berroa or something......the stupidity of this organization is unfathomable right now. I thought we were headed in the right direction coming into this season, but the way they are treating our young guys, we are doomed for 25 more years at this rate. Baird has done a poor job for us over the years, but it is Bell who is taking care of the dirty work now....this is unimaginably horrid work he is doing. Huber should be our full-time DH/1B NOW...I don't think he needs much more development, putting him in the big leagues wouldn't be rushing him. Matt Stairs is okay against righties, but not good enough to be getting at-bats during a youth movement. Unbelievable. Unreal. Thank you!! I was starting to think I was the only one who appreciated what German does! He's patient with at-bats, watches a lot of pitches, gets good contact, runs the bases well...what else do you need?